We are very happy to inform you that the advised port strike in Sweden has been cancelled. We will do our best to get back to our normal schedule as soon as possible. Please be informed that the parties in the Swedish port conflict met independent mediators yesterday, but unfortunately the outcome of these meetings have till now not given any result. The strikes and lockouts will have severe impacts on our services. As previously informed, there is an emerging port conflict in Sweden. Please find below the opening hours in the terminals and our offices during Christmas and New Year’s. Due to All Saints’ Day, our Gothenburg office will close at 13:00 on Friday November 2nd. Gothenburg RoRo Terminal will be closed from 04.00hrs – 06.00hrs Wednesday 26th September due to update of IT system. Det blir ingen ny containerpendel på Vänern mellan Göteborg och Kristinehamn – åtminstone inte just nu. Please note that SOL booking office in Gothenburg will be closed on the 6th of June because of the Swedish National day. Please note that due to the bank holiday (whit Monday) on 21/5, the terminal and booking office will be closed. Picking up and dropping off will be possible again as from 22/5. 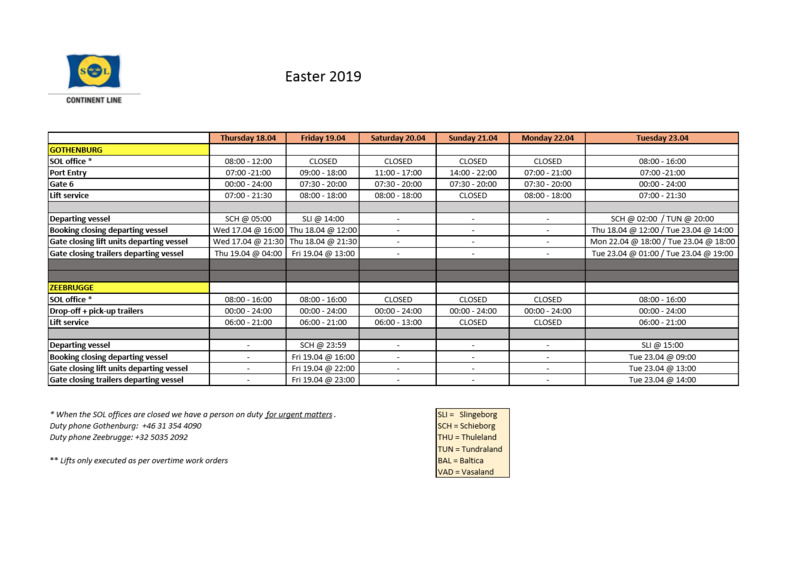 Please find below (and attached) the opening hours during 1st of May and Ascension Day (10th of May). Please be informed that our telephone line is not working for the moment. Please send an email in case you cannot reach us by phone. Hopefully, the problem will soon be solved. 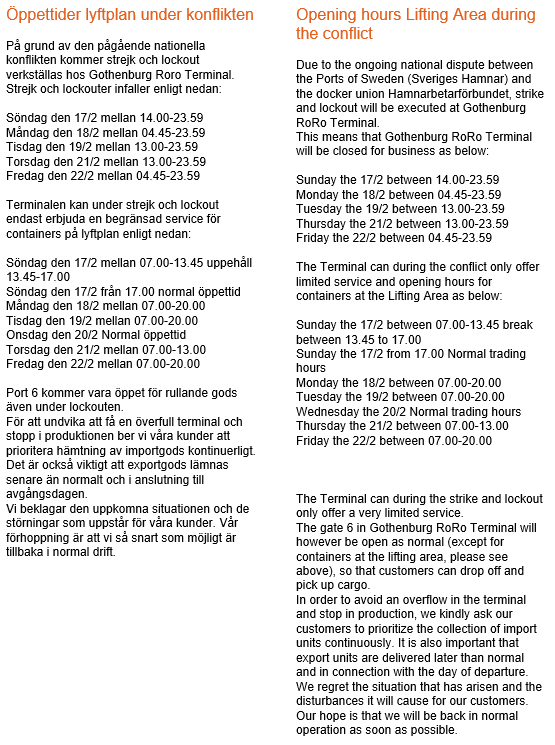 Please find below some updated information from the Gothenburg RoRo terminal. Please find below the opening hours in Gothenburg and Zeebrugge during Easter 2018. During the last few days both you, as our customer, and we as a shipping line have been heavily affected by the problems at GotRoRo. 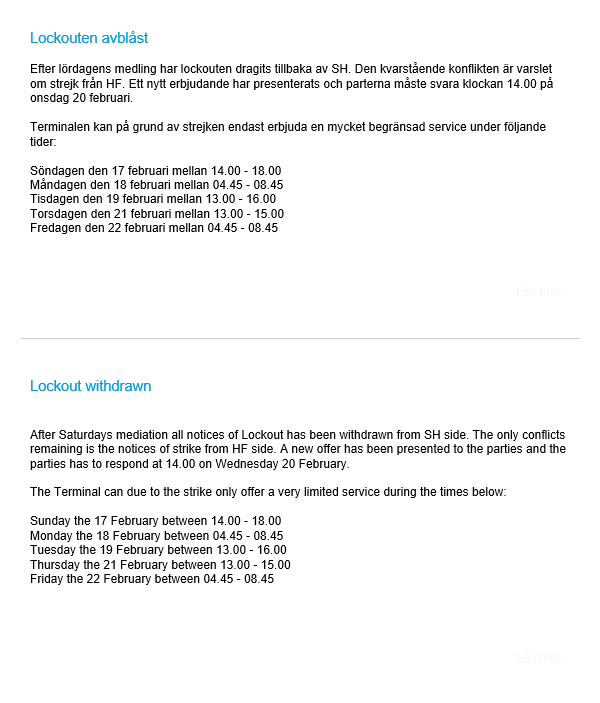 Gothenburg Roro Terminal was closed 19.03 at 18.00-22.00 for all export units due to overflow. Collect import units allowed via Gate 6.